The Lenovo Vibe K5 Plus is now launched. After the successful launch of Lenovo K4 Note, it was time for the company to enter in the sub 10,000 category phones. (Note: The Lenovo Vibe K5 Plus is not a successor to the K4 Note). The Lenovo Vibe K5 Plus features a Octa Core Snapdragon 616 CPU, 2GB Ram, 5 inch Full HD display. The Lenovo Vibe K5 Plus will have to compete against the Coolpad Note 3 which comes with a 1.3 GHz Media-Tek MT-6753 Octa Core CPU, 3 GB Ram, 5.5 Inch HD Display and a Fingerprint sensor for a slightly higer price that is 8,999 Rupees. Octa Core Snapdragon 616 CPU. 5 inch Full HD display. (~441 p.p.i pixel density). 4G LTE Cat 4 (up to 150 Mbps Download & 50 Mbps upload speed) Support. 13 MP (f/2.2 Aperture) rear camera with Omni-Vision OV 13850 Sensor & LED Flash. 5 MP (f/2.8 Aperture) Front camera with Auto beatification using software. 16 GB internal storage. Expandable up to 32 GB via micro SD card. CPU/GPU Octa Core (1.5 GHz Quad Core Cortex A 53 & 1.2 GHz Quad Core Cortex A 53). Qualcomm MSM 8939 v-2 Snapdragon 616. | GPU Adreno 405. DISPLAY 5 Inch H.D. Resolution 1920 x 1080 pixels. (~441 p.p.i pixel density). CAMERA REAR 13 MP (f/2.2 aperture). Omni – Vision OV 13850 Sensor. Resolution 4128 x 3096 pixels. With Auto focus & LED flash. | Features: Touch focus, face detection, panorama, H.D.R, Geo-tagging. | Video Features: 1080 p@ 30 fps, H.D.R recording | FRONT/SELFIE CAMERA 5 MP (f/2.8 aperture). NETWORK 2 G/3 G/4 G L.T.E Cat 4 Support. BATTERY Removable Li-Ion 2750 mAh. STORAGE 16 GB Internal. Expandable up to 32 GB Via dedicated micro SD Card. FEATURES Full H.D Display. | Octa Core CPU. | 4 G Cat 4 Support. | Dolby Audio. CONNECTIVITY Bluetooth v 4.1. | W.I-F.I 802.11 b/g/n. | Hot Spot. | Dual SIM (G.S.M). (SIM-1 4 G (Micro S.I.M.) | SIM-2 4G (Micro S.I.M)). 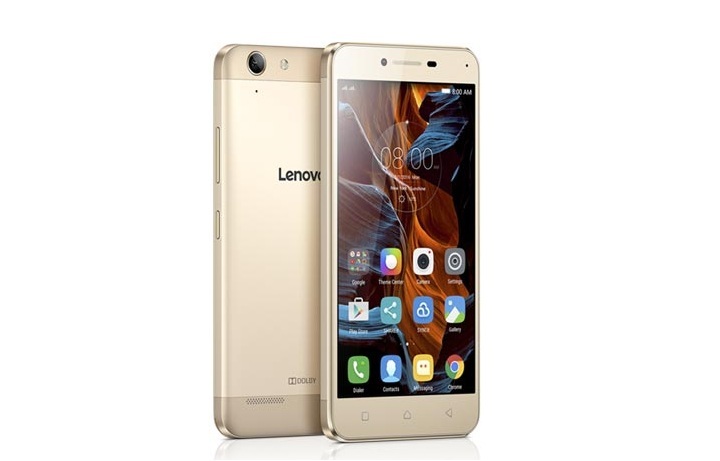 The Lenovo Vibe K5 Plus is now launched in India for a price tag of 8,499 Rupees. It will be exclusively available at flipkart from 23rd March. One great thing is that no registration will be required to buy the device.